How Much Did Medicaid Programs Spend on Sovaldi in 2014? It is important to remember that Daraprim is not the first or only drug in recent years to cause concern among physicians, policymakers, patients and the public. Controversy over Daraprim, the drug that rose in price from $13.50 to $750 overnight, has propelled the issue of drug prices into the headlines and prompted a number of public figures, including Hillary Clinton and Bernie Sanders, to weigh in on the issue. It is important to remember, however, that Daraprim is not the first or only drug in recent years to cause concern among physicians, policymakers, patients and the public. Last year, debates about prescription drug prices centered on Sovaldi, the highly effective Hepatitis C treatment drug that debuted with both extremely high efficacy and price (~$1,000 per pill and an estimated $84,000 for a 12-week course). Concern about drug costs has been particularly acute for state Medicaid programs, which face both limited budgets and high Hepatitis C prevalence among beneficiaries (higher than in the general population). And perhaps with good reason: In 2014, the spending on new HCV medications among Medicaid populations led to historic surges in overall drug spending. Given Sovaldi's recent introduction to the market, my colleague and I sought to better understand how specific state Medicaid programs have used -- i.e., how much they've prescribed and spent on -- the drug. Our brief report, published this week in the New England Journal of Medicine, reveals significant variation in usage. Overall, Medicaid programs spent more than $1.3 billion on Sovaldi in 2014. 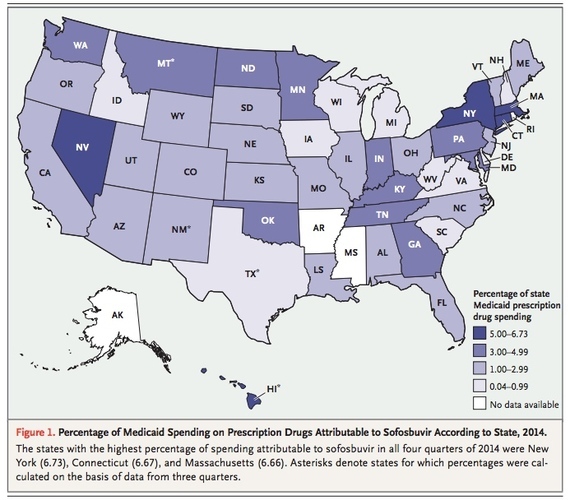 As displayed in the map below, state programs spent anywhere from between 0.5 percent to 6.7 percent of the total prescription drug budgets on the medication, and states that expanded Medicaid under the ACA spent a higher proportion of their budgets on Sovaldi than those that didn't. Our data reflects overall aggregate utilization and lacks patient-level information -- meaning we know what state programs spent in aggregate, but not what is spent on individual patients. The data doesn't account for specific state policies (for example, arrangements or discounts that administrators negotiated individually). While the debate over Sovaldi continues, another important consideration is that, as some have recently noted, Sovaldi has been shown to be cost-effective and provide value in the form of essentially curing Hepatitis C. This suggests that policies that attempt to ensure appropriate use of Sovaldi in high-need populations -- which our analysis calls for -- should not only focus on price, but also the value that the drug can provide to patients. This article reflects the opinions and perspectives of the author and does not reflect the views or perspectives of the University of Pennsylvania School of Medicine.